The internet abounds with legends, conspiracy stories and plain old hoaxes. I am happy to add to that body of knowledge with the strange tale behind why the Olympic torch went out in Great Torrington on Monday 22nd of May 2012. Great Torrington is a town with a long history going back to well before the 13th Century. 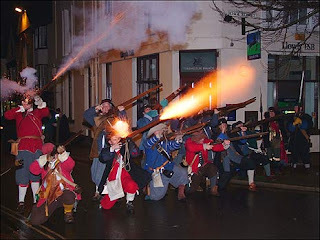 The towns most noticeable historical event was during the English civil war. The Royalist Cavaliers and Roundheads of Cromwell battled in February 1646 resulting in the defeat of the Cavaliers by the army of General Fairfax. Royalist prisoners were locked up in the church, that had also been in use as a power store. Due to a stray spark or flame the church burnt/exploded destroying the church and killing the 200 local prisoners. Wind forward a few hundred years the sight of a government sponsored flame approaching the town with an army of 300 supporters and 30 vehicles may just have been too much for the sad old ghosts of Torrington. The good news is that the current local society of Cavaliers are very much in control of most of the flames around Torrington. Holding bi-annual fundraising bonfire events that involve setting alight historical reconstructions such as life scale Nelsons Victory and in 2010 a huge castle complete with dragon the Cavaliers continue to assert individuality in a good cause. If you can get the chance visit Torrington in North Devon do take the opportunity. Surrounded by 200 acres of common land and linked to the coast by the cycle friendly Tarka trail, Torrington is a great classic Devon town where legends live on.